One of yachting’s most prestigious and long-running brands, Nautor’s Swan, has announced a new yacht and the new Swan 54 is significant in being at the smaller end of the Swan range and of being a purebred cruising yacht. 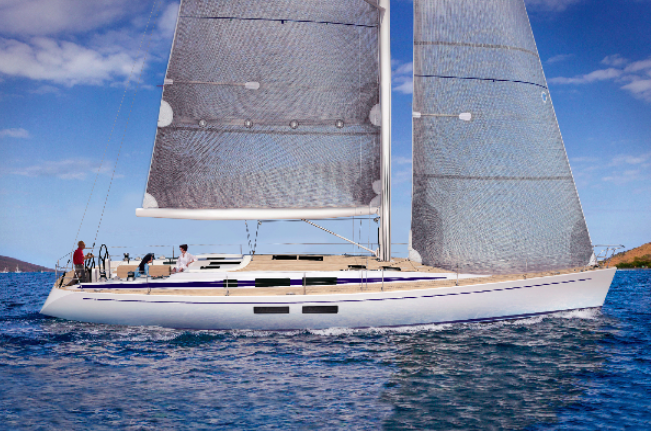 The new yacht has been designed by German Frers, who has been behind Nautor’s yachts for more than two decades. See the history of Swan in our feature here. The Swan 54 will have a moderate displacement hull and high performance lead keel, and is also available with variable draught (1.4m) with an efficient daggerboard and twin rudders. The sail plan is designed for maximum performance with a generous sail area in the foretriangle, but set out for easy handling by a cruising crew. Coachroof mounted jib tracks leading directly to the winches, enable better pointing ability and completely clear decks. Four electric winches, positioned close to the helmsman, facilitate shorthanded sailing. The deck layout has also been designed with limited crew numbers in mind and the transom opens fully into a wide swim platform. There will be plenty of storage space for all the gear needed for bluewater sailing, including the sail locker forward, cockpit locker on the starboard side, as well as in the aft lazarette. Below, the standard configuration has three double cabins, with the owner’s cabin forward and two guest cabins, one central and the other aft. There is also a fourth cabin dedicated to systems and storage, including the generator and washing machine, with the possibility to add a worktable to convert it into a crew cabin. The hull of the Swan 54 is built with single skin construction using glassfibre reinforced vinylester laminate, with multiaxial or unidirectional fibres in selected areas. The deck is in sandwich with closed cell foam core, which reduces weight and insulates. As the company’s new superyacht Swan 115 launches in Finland this summer, this puts focus back on the company’s series production capabilities with a successor to the older but classic Swan 53.